"This easy pea salad has sweet, crunchy pieces of onions mixed with creamy bites of Cheddar cheese. Growing up, a friend of the family made us this pea salad that we love to this day. It's just standard stuff: peas, mayonnaise, egg, cheese, and onion. That's it!" 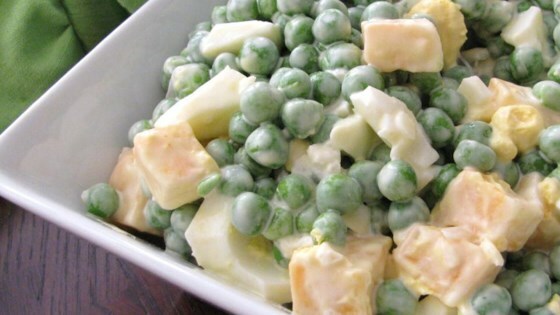 Mix sweet peas, eggs, Cheddar cheese cubes, mayonnaise, and onion together in a bowl until ingredients are coated in mayonnaise; season with salt and pepper. I used frozen peas, thawed, shred the cheese, leave out the egg & add peanuts! Great! I agree on using fresh or frozen peas. Otherwise made it as written and loved it! I added pimento. It gives a little appetizing red color and extra flavor.